Mrs. Jamie Deemy was chosen as the Faculty Focus Friday employee for elementary schools. 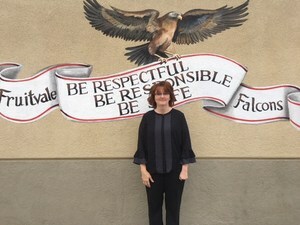 Mrs. Deemy is the English Language Lead Teacher at Fruitvale Elementary School. As the English Language Lead Teacher, she works hard in trying to get as many English Learner students to reclassify by providing after school tutoring for third grade English Learner students. She participates in Fruitvale’s ELAC and Latino Literacy, where she presents valuable information to parents regarding their children’s education. Thank you Mrs. Deemy for being an advocate for the English Learners at your site and for being an integral part in the success of the school!